Every Marine, every veteran, has their own “Staff Sergeant Anderson.” It’s the person to whom we chose to emulate. It’s the person whose leadership and demeanor forever impact yours in and out of uniform. From my first encounter with him, I knew I chose my mentor correctly. I was never lead by any other Marine who exhibited such intensity, knowledge and discipline like he did. The day was hot in Eastern North Carolina as spring was departing and summer was arriving. I blamed the heat for my sweat covered face and drenched Service Alphas, but it was my nerves that were causing my excessive perspiration. I was checking into my first unit at Camp Lejeune, as a slick private who knew little but also, expected nothing. After entering the battalion area, I was swarmed by Corporals who were eager to help me get squared away and welcome me into the family. I was quickly educated on my chain of command, and I stood by, to check in with the First Sergeant. Nerves racing and sweat pouring, I anxiously stood at a hatch with a painted diamond centered between three stripes up and three stripes down, that stood for First Sergeant. That is when I met him. The best leader I would later learn to admire and strive to emulate, my Platoon Sergeant, Staff Sergeant Phillip Jason Anderson. He gave my uniform a quick scan and moved my blouse buckle to the right so that it would be properly aligned. He then reiterated the proper way to report in and be dismissed. He did it in a fashion that was firm but not overwhelming. 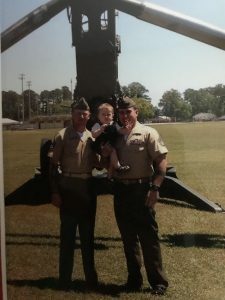 It was that first encounter with Staff Sergeant Anderson that made me realize I did not just represent something, but I represented someone within the Marine Corps. Teamwork was not new to me, having grown up playing sports and having jobs that involved working with others. However, at the end of practices, games, or eight-hour workdays we would retire our teamwork hats and slowly drift back into being an individual. We, the Marines, never stop. We may not always be in the field, deployed, or even on base, but in some way shape or form, we are intertwined, we are one. It is our responsibility as Marines to KNOW one another, to learn their family life, their strengths, weaknesses, hobbies, and interests. As we are given the opportunity to put our theoretical knowledge into action, we find ourselves growing. As our thought process matures and we have proven success, our responsibilities increase. Our professionalism and integrity, guided by values of our oath and branch of service, become unquestionable. The pride and sense of accomplishment we feel for ourselves is secondary to what we feel for our brothers and sisters to our left and right when we achieve success TOGETHER. When I was promoted to Corporal, I learned not only did I have to be my best self but I have to do it for the right reasons. It is no surprise that the Marine Corps breads leaders. It is no mystery that our ethos is Honor, Courage and Commitment. However, it would be brave to say that the majority of the civilian population understands and utilizes our leadership traits. Accepting and using our fourteen leadership traits: JJ-DID-TIE-BUCKLE is not a one-day feat, but rather a lifetime of dedication. Justice, Judgment, Dependability, Initiative, Decisiveness, Tact, Integrity, Enthusiasm, Bearing, Unselfishness, Courage, Knowledge, Loyalty and Endurance are the traits that an immense number of Marines were able to witness every day from Staff Sergeant Anderson. Before joining the Marine Corps, I took the simple qualities of a good leader for granted. I was fortunate enough to have many great leaders, but Staff Sergeant Anderson always held the bar higher. To this day I still introduce him as my mentor, and even though he will soon be promoted to Sergeant Major, we will always acknowledge each other as BROTHER.